Snow ends midday, west to east. Highs in the low 30s. Overnight Tuesday: Skies gradually clearing. Lows in the teens to low 20s. We start off our Tuesday morning with some snow showers, especially closest to the coastline. The snow showers exit earliest for interior New England, lasting at the immediate coastlines through at least noon before the snow departs. Main impacts besides slick roads and sidewalks associated with the snowfall is the possibility of minor coastal flooding, coupled with gusty northeasterly winds for Tuesday morning’s high tide. So for coastal areas, especially those facing northeastward, minor coastal flooding is possible from 8 a.m. to noon, along the eastern Massachusetts coast, including the Cape and Islands. Accumulations could reach upwards of 4 inches around the Cape Cod Canal, with lesser amounts for the Outer Cape and Islands with totals between 2-3 inches since we’ll see some mixing at times. 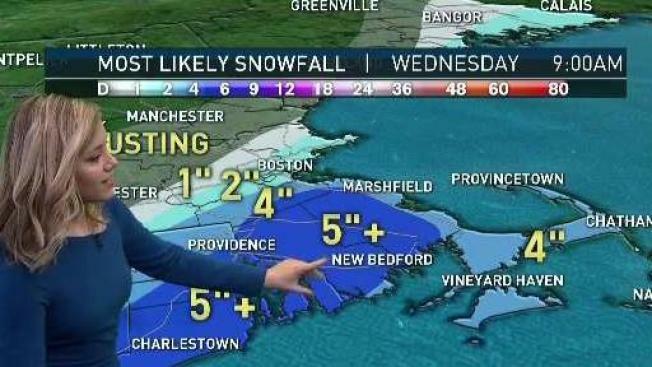 A dusting to 2 inches is likely for the Boston to Worcester areas, to Providence to eastern Connecticut. Plus, southern New Hampshire to southern Maine will likely see a dusting to an inch, with Downeast Maine likely getting at least 2 inches. Tuesday’s high temperatures only reach into the lower 30s for most locations and we could even see some glimpses of sunshine after the snow departs. Wind shifts to out of the northwest for Wednesday, ushering in a colder, but brighter forecast for the middle of the week. Wednesday’s high temperatures only reach into the upper 20s to lower 30s. Thursday brings a very quick warm-up with highs into the lower 40s south, 30s north with snow showers for the mountains. More widespread wintry weather arrives early Friday, starting off as rain to a mix south, snow north and eventually everyone sees the changeover to snow as a cold front traverses the region. We’re keeping an eye on that system as we get closer. For this weekend, back here at home in New England, Saturday looks colder with partly sunny skies with highs into the lower 20s, with Super Bowl Sunday bringing highs into the low to mid 30s under mostly cloudy skies and a chance for snow late Sunday into early Monday. We’re keeping an eye on Sunday into Monday’s system as many people will be traveling both days for Super Bowl watch parties or traveling back from Minneapolis. If you’re traveling to Minneapolis for the big game, pack those warm layers! High temperatures this upcoming weekend will be into the low to mid-teens, so thankfully, the game will be played in a stadium that’s nice and toasty. We’ll continue to not only watch this Friday’s system, but also the possibility for another system for Monday.